« Get ready for the insider perspective. I have mentioned Larry in previous blogs in the past as well as gave a short introduction about him yesterday. What I didn’t mention is that Larry is a consummate professional and astute security expert. As you will read in the next 2 days of this interview, Larry serves as the security consultant for many companies and has trained and developed the security programs for many Fortune 1 and 5 companies that you are aware of. Well into his sixties, Larry is still in better shape than many people 1/3 of his age. When you see the attached pictures, the only thing that has changed about him is the grey on his head. He still runs over 20+ miles and week in conjunction with biking and swimming in order to maintain his competitive edge as a triathlete. 1- Larry tell the readers a little about your pre Service schooling. 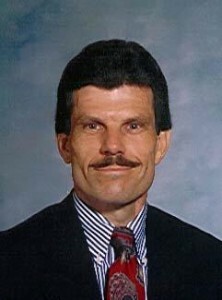 Where did you get your formal education and what made you decide to take a career path in the USSS. I come from a fairly competitive family and my earliest memories regarding careers usually centered on the importance of school and doing your best. I made the mistake once by getting a “C” in English and had to spend two hours everyday one summer going to my “mother’s summer school” while the rest of my siblings and cousins went swimming. I would have rather drank battery acid. The message was pretty harsh…”most of your relatives are either doctors, lawyers, professors or judges; if you want to amount to anything, you need to be one of those…” Other options were not discussed. So I pursued the doctor route. For a variety of reasons, it did not happen. However, the Kennedy assassination eventually would have influenced a change of career direction. As most of us old enough to remember the Kennedy assassination, I vividly recall exactly where I was and what I began thinking about at that moment. In the back of my mind, I thought that I might have been able to make a difference to preventing an attack like that if I were in the Secret Service. That lingering thought became compelling and when the opportunity presented itself, I joined. Being the oldest of six other siblings, I was in a “protective mode” most of the time anyway so being a bodyguard of sorts would be a natural transition. I went to elementary schools in Maryland and in Germany while my father was stationed there for several years. I graduated high school from St. Maria Goretti in Hagerstown, MD and graduated from Mt. St. Mary’s College in Emmitsburg, MD with a major in Psychology and a minor in Science. I began thinking more seriously about the Secret Service after graduation and decided against medical school after a year with the Frederick County School System as their Vocational Evaluator. 2-When did you join the service and how many years of service did you give? In February 1974, I was appointed as Special Agent, U. S. Secret Service assigned to the Philadelphia Field Office of Investigations. I served 20 years and retired in 1994. 3-Can you give a synopsis of your career track within the service and what was your job when you retired. I began my career in Philadelphia, PA in February 1974 and remained there for five years during which, I was assigned to the check forgery and counterfeit squads learning how to conduct investigations, surveillances and prepared cases for trial. I gained a more refined knowledge of the law of arrest, search and seizure, how to testify effectively. My last assignment in Philadelphia included the Protective Intelligence squad investigating threat cases. This involved evaluating threats, interviewing and/or committing mentally disturbed persons making threats to the President, Vice President, former Presidents and others as defined by law. Normally, new agents are assigned to larger field offices throughout the United States and are usually required to serve for several years to learn the “ropes” of investigation and are given light exposure to protection with temporary assignments to foreign heads-of-state. Some agents remain in investigations and others are assigned to headquarters assignments or protective details as they advance in their careers. As with most things in life, persistence and opportunity usually find a nexus with luck and one finds their chosen path. Careers in the Secret Service are no different. From 1979 – 1982, I was assigned to the USSS Office of Training and taught in all areas of Secret Service jurisdiction. I regularly instructed all levels of Secret Service personnel in these areas. I progressed to a level where I was given the opportunity to revise and develop curricula in diverse areas of protective and investigative jurisdiction. Following the attempted assassination of President Reagan, I researched and developed the revised physical fitness program adopted as policy by the Secret Service to include the development of a stress management program for in‑service agent personnel. A significant portion of our training effort included conducting Protective Operations Briefings for police departments nationwide to ensure mutual understanding of protective procedures. In 1982, I was fortunate to be asked to join the White House Presidential Protective Division, PPD and remained there for five years assigned as a “shift agent” (bodyguard) and security advance agent. I conducted lead and site security advances for Presidential visits to Canada, France, Germany, Grenada and 20 domestic cities with some involving as many as 2500 police, military and political entities. I supervised the working security agents while traveling with the President to a variety of venues, served as “advisor” to agents assigned their first lead security advances and conducted advance agent seminars for all detail agents. I was assigned as the Agent-in-Charge of the USSS office in San Jose, CA for seven years before retiring in 1994. I coordinated and supervised the security arrangements for the visits of world leaders to the Silicon Valley including Presidents of the United States, Presidential Candidates, Pope John Paul II, Mikhail Gorbachev, and other foreign Heads of State. These visits included the integration of law enforcement personnel, military personnel and other public safety organizations. Investigatively, the San Jose office, under my supervision, was responsible for the development and successful prosecution of 75 ‑100 domestic and international criminal cases involving threats to the President, counterfeit money and other financial crimes to include complex telemarketing, computer hacking and “high tech” operations. In conjunction with these efforts, the San Jose office investigated and prosecuted precedent setting cases resulting in updated Criminal Federal Statutes. 4-Under what president did you enter PPD and how many presidents did you serve under PPD? I entered PPD in 1982 and remained there until 1987; all during Reagan’s administration. During my tenure in the service, I served under President’s Nixon, Ford, Carter, Reagan and Bush (41). I was assigned to Presidential and Vice-Presidential candidate details for VP candidate Rockefeller, Mondale and Stockdale, Presidential candidate and GOP nominee Reagan. Earlier, I was assigned to President Ford’s skiing detail. I conducted security advances for numerous other candidates to include Quayle, Buchanan, Dukakis, Jesse Jackson, Bush (41) and Clinton. 5-In PPD can you tell the readers some of your most remembered tasks and responsibilities? 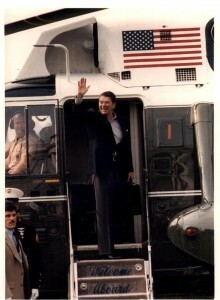 While assigned to PPD, I was assigned to conduct various domestic and international security advances, the most memorable of which include the lead advance for the State-of-the-Union address at the Capitol for President Reagan in 1983, the Lead advance in Los Angeles (for 7 days) in 1983, the Lead advance for the 40th Anniversary of the D-Day invasion in Normandy, France in 1984, the Lead advances in Ludwigshafen, Germany and in Grenada (Leeward Islands), both in 1985. 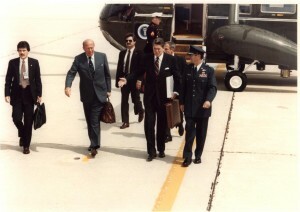 These visits by President Reagan had unique security challenges that required creative solutions. Part II will continue in tomorrow’s blog where Larry will discuss the overwhelming emphasis on weapons and how this really plays in the mindset of an expert of his caliber.